Shelter Cove Marina offers two unique ways to take flight over the water this summer: parasailing and jetpacking. For a calm, yet high-flying experience, Parasail Hilton Head has the ride for you. Safely seated and harnessed to your parasail (like a giant colorful parachute), which is tethered to the boat, you’ll get 10-12 minutes of air time and ascend up to 500 feet before coming in for a soft landing on the special flight deck aboard the boat. Captain Matt Williams offers a personalized experience by taking only six passengers out at a time. Fly solo or double, and choose if you want to be dipped in the water or not. Your wish is the captain’s command! 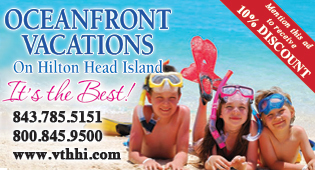 For more information and to make your reservation, visit parasailhiltonhead.com. 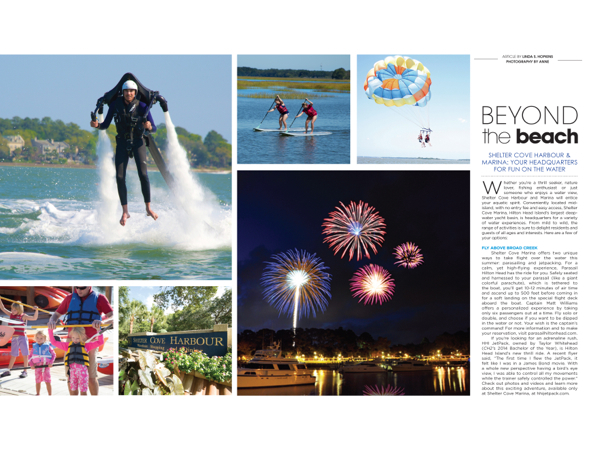 If you’re looking for an adrenaline rush, HHI JetPack, owned by Taylor Whitehead (CH2’s 2014 Bachelor of the Year), is Hilton Head Island’s new thrill ride. A recent flyer said, “The first time I flew the JetPack, it felt like I was in a James Bond movie. With a whole new perspective having a bird’s eye view, I was able to control all my movements while the trainer safely controlled the power.” Check out photos and videos and learn more about this exciting adventure, available only at Shelter Cove Marina, at hhijetpack.com. As a bonus, on the way to open waters, both of these unforgettable flying experiences include a relaxing boat ride through picturesque Broad Creek, where playful dolphins, an amazing variety of Lowcountry birds and other wildlife are sure to entertain. Think of it as a nature tour and action adventure trip all in one. Summer fish include big sharks, king mackerel, Spanish mackerel, barracuda, tarpon, Jack Crevelle, redfish and cobia. Customized half-day and full-day trips, and evening shark fishing trips can be arranged in Shelter Cove Marina. When you’re ready to drop a line and spin some new fish tales, Shelter Cove Marina offers an excursion just right for you. Inshore, near shore and offshore fishing is available through five private charter boats at Shelter Cove Marina: the 35-foot Gullah Gal (six people), the 34-foot True Grits (six people), the 26-foot Fin-atic (up to 11 people), the 24-foot Bayrunner (four people) and Palmetto Lagoon Charters, specializing in fly rod and light tackle fishing. 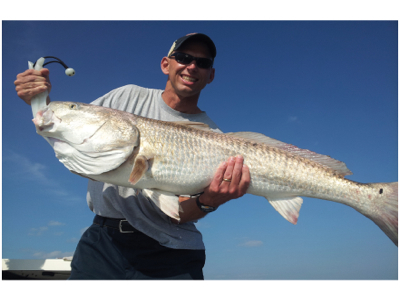 Summer fish include big sharks, king mackerel, Spanish mackerel, barracuda, tarpon, Jack Crevelle, redfish and cobia. Customized half-day and full-day trips, and evening shark fishing trips can be arranged. An additional unique offering at Shelter Cove Marina is sport crabbing aboard the Crabber J II—a fabulous family outing. It’s all catch and release—just for fun—but the crew keeps score, and whoever catches the most wins the world famous Crabber J T-shirt. Families and large parties will enjoy the Captain Hook. Charter it or join in a scheduled trip with other guests. At 70 by 21 feet, the Capt. 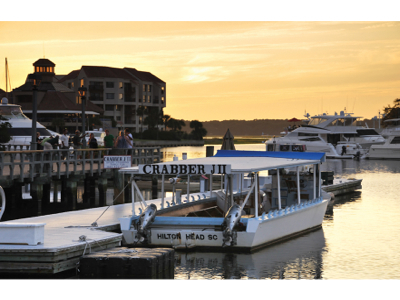 Hook is Hilton Head Island’s largest, most comfortable party fishing boat, accommodating up to 60 anglers. With a full galley, enclosed cabin, shaded and seated fishing areas, two restrooms and sun bathing on the upper deck, a good time is guaranteed. Reservations are suggested, and all trips include bait, tackle, rod & reel rental, instructions and fish cleaning. A fun-family outing at Shelter Cove Marina is sport crabbing aboard the Crabber J II. It’s all catch and release—just for fun—but the crew keeps score, and whoever catches the most wins the world famous Crabber J T-shirt. For those who would rather passively observe the marine life, dolphin cruises, nature tours and sunset sails get you up close and personal with the area’s wildlife and natural beauty. Cruise boats include the 80-foot double deck Holiday, operated by Adventure Cruises, with a snack bar, restrooms and shaded seating. Trips offered include dolphin watch and sunset cruises, as well as a special two-hour sunset cruise every Tuesday night this summer to view the HarbourFest fireworks from the water. The Fin-atic, also operated by Adventure Cruises, offers nature cruises as well as fishing excursions and can accommodate 11 passengers. Prefer the flap of the wind in a sail? Check out the Special K, a 40-foot luxury sailing yacht available for group excursions or a private captained charter. 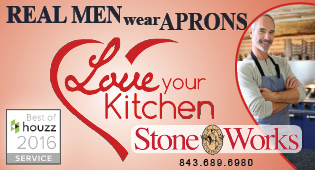 You can bring your own snacks or arrange for catering. They’ll even teach you to sail if you so desire. And yes, there is a restroom facility onboard. For a more active adventure, pontoon boats, kayaks and stand up paddle boards are available for rental from Outside Hilton Head. 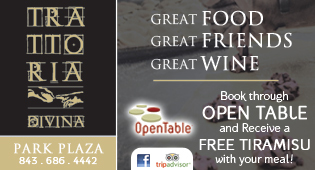 Explore on your own, or take a guided tour with a group. If you’re not sure which boat to book or what experiences to choose, call the marina at (843) 842-7001 and let Harbormaster Kyle McDaniel help you make decisions that will best suit your interests and needs. Not everyone loves a boat ride, and for those who prefer to keep your feet on the ground, a stroll along Shelter Cove Harbour is the perfect way to take in the water views and stay dry. Known for its array of shops and restaurants, now there’s even more fun to be had at the Art Café, Too, a paint-your-own pottery studio. For more information on all fishing and boating options at Shelter Cove Marina as well as other activities on the Harbour, visit palmettodunes.com or call (843) 842-7001. After a fun day on the water, you’ll want to relax and enjoy HarbourFest, the island’s annual summer tradition featuring Shannon Tanner at the Shelter Cove Harbour stage Monday – Friday nights from 6-9 pm, plus Cappy the Clown.. Tuesday nights from 6-9 p.m. will includes arts and crafts, a variety of music and fun. Fireworks displays begin June 17 and take place at dusk every Tuesday night thru August 12, weather permitting. (No show July 1—special display on Friday, July 4). Read all about HarbourFest in the next issue of CH2. 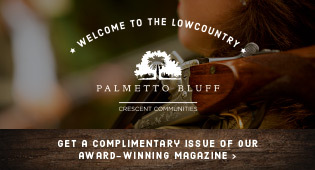 For more information now, visit palmettodunes.com/harbourfest-hilton-head.php.